Bellatrix, I'm a Pug! : Pugsavers to the rescue!! 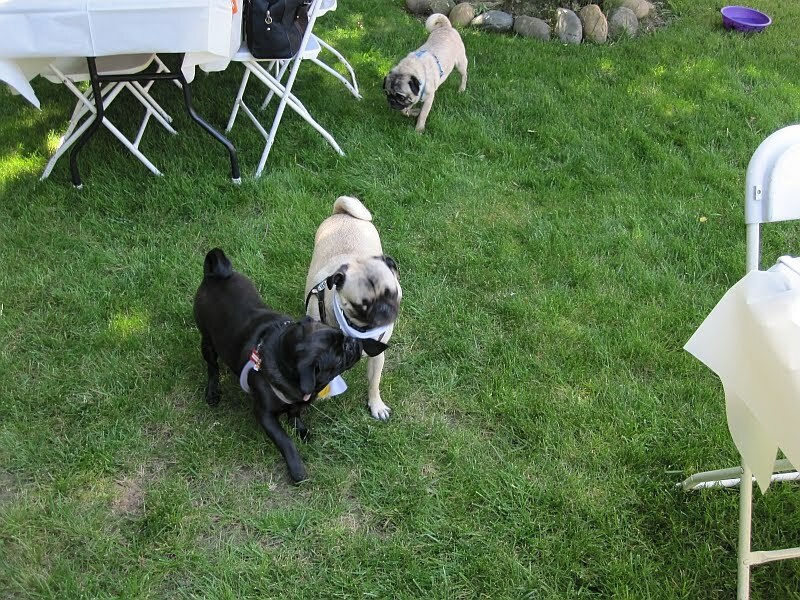 So on Saturday my bud Spencer and I went to this really cool pug event to help raise funds for pugs in need. 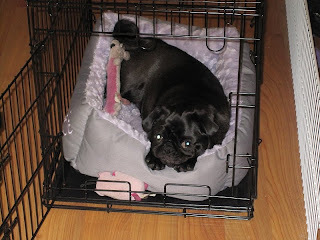 The event was put on by Pugsavers and I hope we helped just a little bit with that. First off Spencer and I wore matching bow ties that his grandma made for us. Notice how his tie was black and mine was white? It helped to offset our own pug colors and show that we were a couple. Also please notice that they both turned towards the right, this wasn't on purpose, great minds just think alike. Notice how we both are wearing our best smiles and the wisdom in Spencer's eyes...he's one handsome pug. I'm a lucky girl. When we arrived to the event, we made sure we checked out the perimeters. We had to make sure it was safe and that we had plenty of room to play. Our moms (and Spence's grandma) sat in the shade while we ran around and greeted everyone there....whether they wanted to say hi to us or not. I think Spencer really came out of his shell, he even flirted a little with this pug wearing a pink dress with polka dots. I made sure he knew she lived too far away to make it work. He really should have known better than to flirt in front of me! Shesh..men! 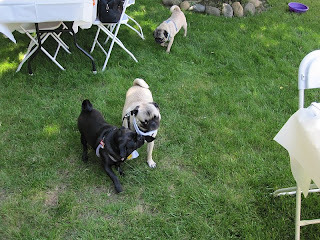 The event was lots of fun, mom even won some cute pug items in an auction...she said the money was for pugs in need so it was all worth it. The ride home was quiet as Spencer and I had a pug hangover. I was so tired I skipped dinner!! I'm sure that's a first in the history of pugdom. I was a bit sleepy, even today, so I just kinda hung out. It was loads of fun and I can't wait until Pug-o-ween. If you live in the bay area...maybe you'll want to join us? 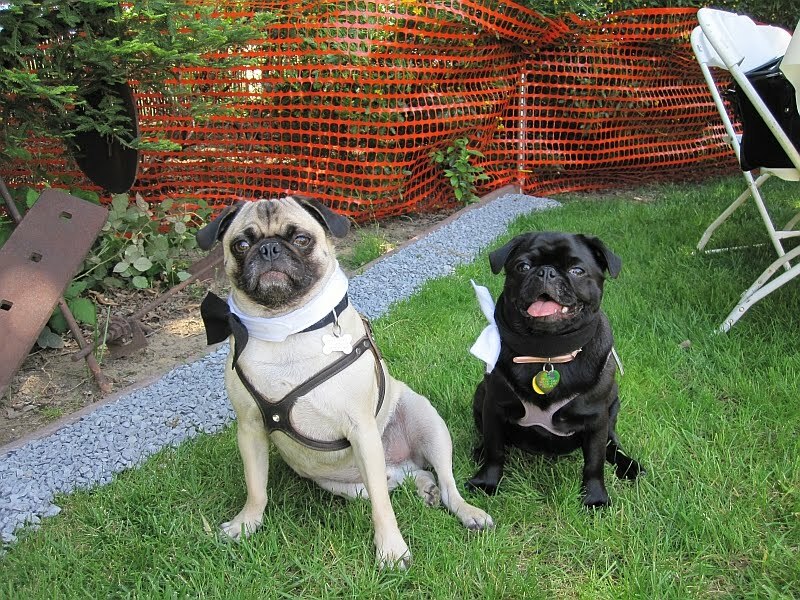 OK, you and Spencer were the cutest pug couple BEFORE the matching bowties. But with the ties?? You're the crazy cutest. So cool you spent your Saturday helping save puggies. Must have been one wild party if you were too hungover to eat dinner!?!? Oh Bellatrix!!! You and Spencer are the cutest puggie couple in the PugUniverse!!! We do love love the matching bow ties! The whites ones for you and the black ones for Spencer is such a cutes idea!!! You two kids are fabulous!!! HOT STUFF!!! Glad that this event was to help out our wonderful species and Bella you are a Lucky lady to have Spence, but he is just as Lucky to have yous!!! Next time have the dinner and maybe a cookie too!! Hiya Puglet, I was so happy to help pugs in need, that made the event even more special. Spencer and I tore that place up! I don't like to wear clothes, but that tie was right up my alley. I saw Spencer wearing it and knew I could do it too. He's one suave pug. Hiya Gang!! Spencer and I agree that we were the cutest couple there. I was going to have to take that dress wearing pug out, but Spencer came to his senses. Mom actually took a picture of her..something about me dressing up...she must be off her rocker. I was so hungry when I woke up this morning, I had to eat to make up for all that food I didn't eat last night. Imagine a pug too tired to eat. I'm a little disappointed in myself! You two are adorable! You know, Spencer probably was telling that other girl pug that you were so cute; that you don't need to wear a dress. Thanks for helping all the needy pugs. Hopefully they can all find good homes. How fabulous you and Spencer look together. Lots of pug partying going on this weekend! And yours was for a great cause, even better! We totally rocked that party BT! My bow tie got really dirty from all the fun we had...it was totally worth it. Did you tell everyone about the little cakes they passed around for us Pugs?! I think my bow tie was at its maximum...I ate a lot. I also peed on everything there...just to let them other puggies know what's up.